This article in our series is by Alex. As a long-time endometriosis sufferer and someone who has had most of her ovaries destroyed by undiagnosed endometriosis. I gave myself a diagnosis in medical school, which my doctors chose to ignore. I have a soft spot in my heart for this topic. I know and intimately understand when discovering that you have a low ovarian reserve is like when you’re “completely healthy” according to doctors in your early 20s. And with 3 failed IVF cycles under my belt, I know what that feels all too well. And if you’re going through this, understand you aren’t alone on this journey. There are several blood work markers that can give us a clue into the presence of low ovarian reserve in a female. The most important one is called AMH (anti-mullerian hormone), which starts out high when we first hit puberty, and gradually decreases until menopause. Because this decline is predictable and gradual, each age range for females has an “expected” AMH level. LH and FSH levels are other blood work markers that can determine low ovarian reserve. The problem with these is they are late to show falling ovarian reserve so are only very useful at the end stage of this disease process. 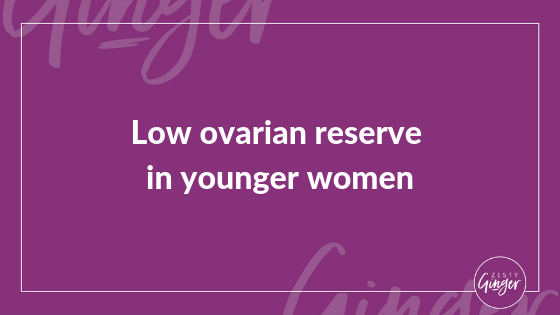 There are quite a few causes of the low ovarian reserve, but in the most basic sense, anything that damages the tissues of the ovaries will knock off potential eggs. Endometriosis is probably one of the most common causes of ovarian damage in women, but the problem is endometriosis is so underdiagnosed that it’s hard to define actual research numbers to back that up! PCOS, ovarian torsion, autoimmune damage, and injury from infections or trauma are all reasons younger women can have low (or lower) ovarian reserves. Although there isn’t as much data to “prove” it–that severe nutritional deficiencies and gut issues can lead to inflammatory damage to the ovaries. Even though I knew better, I initially panicked and threw everything and the kitchen sink at my ovarian reserves. I looked up studies on everything from DHEA to CoQ10 to Vitamin E to bee propolis for supporting high-quality egg production. While I still very much believe in the benefit of these things, I ultimately got the most out of testing my hormones with the DUTCH test (our preferred hormone panel) and following a protocol especially tailored for me. Now I’ve redone the test more recently, I’m continuing to tailor my approach with my current ovarian reserves in mind. While I don’t expect to get ovarian tissue back (as ladies, we are born with all the eggs that we will have), I have seen a rise in my AMH levels in response to this work. My hunch is I have optimized my ovarian health enough, so the ovaries were able to salvage the tissue that was still limping along. Because the tissues of the ovaries are already struggling in someone with low ovarian reserve, nutritional sufficiency and variety are especially important. Providing the body with all of the building blocks and tools it needs to maintain function allows the body to do what it does best: heal what it can and rebalance the rest. I have been so incredibly grateful to have these tools to lean back on as I was getting diagnosed, going through IVF, and planning out our future family! This has been one of the hardest aspects of living with endometriosis, and I’m so happy that I have seen the recovery. Our last article in the series is rapidly approaching! To finish up this series on common hormonal imbalances and how to tackle them, we wanted to talk a little bit more about the cycles of the moon and how it impacts us as women.